Tata Structural Steel Hollow SectionsTata Structura Steel (round, square & rectangle) hollow/box/closed sections. Tata Structura I & H beams/column section. We are involved in offering a wide range of Steel Hollow Sections to our most valued clients. Our range of Steel Hollow Sections is widely appreciated by our clients which are situated all round the nation. We offer our range of Steel Hollow Sections at most affordable prices. The steel at Jainkoch is produced through various process such as hot rolling, cold drawing, peeling and grinding which is being extensively used by the Railways, Defense, Automobile Industry, Flywheel Ring Gear Industry, Bearing Industry, Roller Chain Industry, Hand Tools Industry, Raw materials for Bicycles as per grades JIS/IS/BIS/DIN/SAE /ASTM etc. MPK Steels India Pvt. Ltd.
VishWas Tubes India manufactures rectangular and square hollow sections at the standard tube plant in the High Frequency Induction Welding Mills. The products manufactured can be supplied to IS:4923 up to maximum 180 x 180 x 5.4mm for square and 200 x 100 x 540 mm for rectangular. At par with the requirement of our esteem clients we offer a wide assortment of steel hollow sections (SQUARE, RECTANGULAR AND OVAL). Designed in compliance with international standards our tubes are extensively used in making school furniture, office, bus body building, canopy and stair case railings. Heavy or structural sections are steel products such as beams or columns which are usually formed with a specific cross section shape e.g. H, I or U. These are used to build large structures such as multi-storey buildings and bridges. 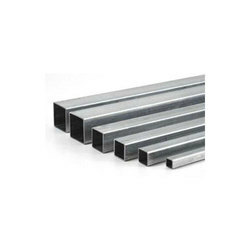 We are one of the top supplying and trading of assorted range of premium quality Tubular Sections which is used in various industrial applications. This offered product is widely accepted due to customized solutions of the entire range. Owing to affordable price range, this system is widely popular in the market.